Lindsay Mason: Pictures to show! Hello all, it's been a good few days since my last post as family things have been taking precedence over the last week or so. I hope to make up for it with a fairly long post now, with some great pictures too! This time last week was my birthday and I received some lovely cards and gifts from very kind friends... ....clockwise from the back are a gorgeous canvas that the lovely Joanne made especially for me, next to that is a decorated jar filled with chocolates and labelled "Lindsay's very own chocolate treats jar"! This was from Chris but I must confess that David is munching on one of the bars as I type!!! Next to the jar is a lovely card that Joanne sent me - not for my birthday as such, but thought I'd include it anyway! Below that is a beautiful card sent to me by Gez . At the bottom is a gorgeous felted card from Chris which has a lovely heart shaped felted brooch attached to it. The teeny canvas is from Joanne and "T" and has a delicate, and very pretty heart pendant secured to it. In the centre is a dragonfly beaded box containing a really sweet silver cat wine stopper, also from Joanne and "T". Thank you so much ladies (and "T"!) for your kindness and wonderful creative generosity. Below is the birthday card that Joanne made for me...hard to see the dimension in this photo. 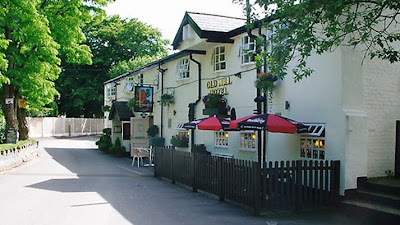 Although I had a busy schedule David insisted we went out for the afternoon and we ended up, after a lovely drive around nowhere in particular, in Alsager, Cheshire, where we came upon a well hiden gem called "The Old Mill". 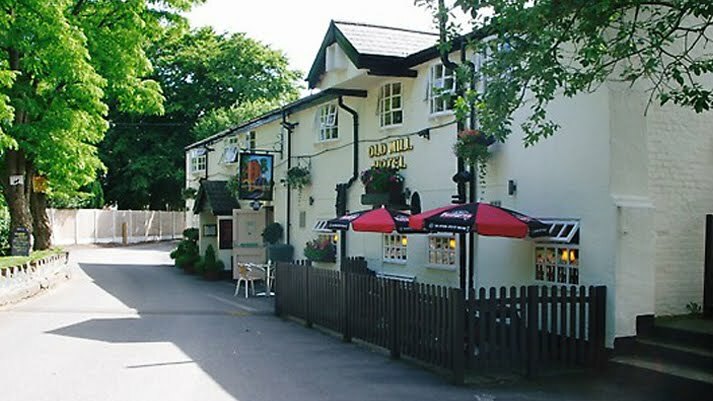 It was a quiet, old Inn complete with mill pond. We had a delicious meal (the chips were home made - not frozen! Crikey, that's a rare thing these days!) which the resident black labrador would have happily cleared of any remains! Afterwards we wandered out to the mill pond and, as we had seen a large fish leaping out of the water before we ate, I threw some breadcrumbs onto the surface. They immediately attracted quite a few large Carp and we were treated to the sight of them coming right out of the water to grab the bread. Made a change from feeding ducks! If you are ever near the area we can recommend a visit. So it was a lovely birthday, topped off with beautiful red roses from David. Now, as promised, here are pictures of the Chunky Book which I received the Saturday before last from Sheila when we last met at my workshops in St Helens. Sheila did a great job of putting the books together despite the setbacks of a couple of people having to drop out of the swap and some of us (including me!) having to ask for a time extension to get pages made! Everyone involved chose the theme they would like for their book and here is mine - I chose "The magic of water". Here is the front cover...Sheila made all the front and back covers herself. Here are the inside pages - each picture shows the back of the previous one as well as the next page. The first one is this stunning piece by Joanne, which has so much detail and depth to it. I can't even imagine how long this must have taken to put together, never mind thinking of the design in the first place! The next picture shows one of Sheila's pages...Sheila knows my favourite colours that's for sure, and the sentiments on this page are very appropriate just now. The Glossy Accents just emphasises the watery feel. Gez made this next page which is so well thought out and very evocative of sunny days by the sea. I love the colours here too. Next up is my own page which I used Colourwash dyes to make the background for. I drew, coloured and cut out the Mermaid, strengthening her with Glossy Accents. Next is another page by Sheila featuring another Mermaid. The faux bleached water effects on here are so effective and I love the colour combinations. A different Mermaid here on this page made by Elaine. I love Mermaids, so the more the merrier and this one is certainly unlike the rest! I love this shimmery aqua page. This nostalgic page was created by Karen and really captures the feel of a day at the beach. This dreamy page is by Sonja and I really like the way she has got that foamy quality of a crashing sea as well as the quote from Cristopher Columbus. Zoe's page is full of texture and contrast and I especially like the shiny fibres that tumble down into the Koi pond below. Hilda made this very different page which has subtle stamping and a great dictionary panel - I love dictionary definitions! The last page is by Cheryl - great colour and the paddling foot made me smile! Here is the inside back of the book. Well, hope you enjoyed looking at the Chunky Book which I will treasure. It was a labour of love for all involved! Last Saturday I was at Crafts U Love, in Charlwood, Horley, for their fifth birthday celebrations. It was a day of classes and demonstrations and everyone had a lovely time. Hello to all the ladies I met there (no men I'm afraid!) and hope to see you again soon! Well, I hope I have made up for my recent lack of posting and will try to post again before the weekend.